The Mansfield House Hotel is situated in approximately 10 acres of established grounds on the outskirts of Hawick, the largest of the Border towns famous for the Common Riding, rugby and knitwear. The house was originally the private home of the Oliver family built in the late 1800’s. This well established local family tastefully influenced the many distinctive architectural features, from the thistle and rose ceilings in the lounge and reception areas, to the Russian pine shutters, skirtings and doors throughout the main ground floor of the house. The attention to detail in the design and finishings are a testiment to the skilled craftmen that created this fine building. Current owners the MacKinnon family have been at the hotel since 1985 and have over the time loving restored the hotel, and added many features to make the Mansfield what it is today. The gardens have been gradually restored to their former glory and the wooded hillside that surrounds the hotel is an small adventurers playground. The Mansfield has two rooms suitable for meetings and training events. The Thorwood Suite is also suitable for exhibitions with ground level access. Following is the dimensions of both the rooms, for further details please contact us direct. The hotel has break out areas, however, there are no designated syndicate rooms. Inclusive of arrival coffee, morning coffee & biscuits, 3 course lunch & coffee, afternoon tea & slices, room hire. 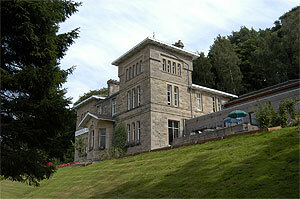 Inclusive of arrival coffee, morning coffee & biscuits, soup & sandwich lunch & coffee, afternoon tea & slices, room hire. Hawick, the largest of the Border towns, is part of The Cashmere Trail and the major centre for the industry in the Scottish Borders. You will find big names and smaller designers in the many specialist shops throughout the region. If you want to see how it is done, you can see garments in progress at the Hawick Cashmere Company and get the inside story on textile production at Peter Scott’s. Hawick Museum and Scott Gallery reflects the town’s history and hosts visiting exhibitions on any number of topics. Get back to nature at Wilton Lodge Park in over 107 acres of riverside and tree-lines walks and recreation facilities. Teviotdale Leisure Centre provides year-round watery and other indoor distractions for all the family. The open spaces of the region lend themselves to sightseeing, fishing, walking, cycling and golfing. Hawick is also an ideal base for the visitors wishing to visit the mills, shops, local attractions and leisure. Within a short travelling distance of Hawick the following are some more suggested attractions. 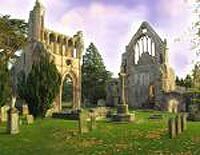 Discover the land whose history is more turbulent and romantic than most, with 4 elegant Abbeys that of Dryburgh, Jedburgh, Kelso and Melrose. For imposing Castles there is Hermitage, Smailholm, Floors, Thirlestane, Ayton and Neidpath. And dont miss the stately mansions and Historic Houses of Traquair, Manderston, Abbotsford, Bowhill, Queen Mary’s House and Mellerstain. About an hours drive east of Hawick is the Berwickshire coastline, with small villages, sandy coves, fishing harbours and beautiful scenery. Ideal for a spot of ‘twitching’, walking, diving or fishing. Edinburgh is within easy driving distance with much to see. There is the Castle, Scott Monument, Holyrood Palace, The Royal Mile, Princes Street (shopping), historic buildings and museums, botanical gardens, Edinburgh Zoo and the Royal Yacht Britannia which is berthed in Leith.